Deciduous perennial arising in vase-like clusters or singly. Triangular to oblong-triangular, 20-70 cm long, 10-60 cm wide, sparsely glandular on rachis and lower side of pinnae, 2- to 3-pinnate, the lowest pinnae longer than the upper ones, leaf outlines triangular. Mesic to wet forests, forest margins and scree slopes from the lowland and steppe to subalpine zones; common in BC; circumpolar, N to AK, YT and NT, E to NF, S to MI, WI, MN, CO, ID and CA; Eurasia. 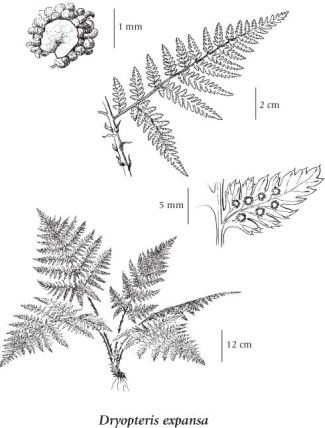 A shade-tolerant, submontane to subalpine, circumpolar fern (transcontinental in North America). Occurs on fresh to very moist. nitrogen-medium soils within boreal, cool temperate, and cool mesothermal climates; its occurrence increases with increasing pre­cipitation. Common and occasionally dominant in coniferous forests on water-shedding and water-receiving sites; often inhabits decaying wood. Associated with Blechnum spicant, Polystichum munitum, Rhytidiadelphus loreus, and Vaccinium alaskaense. Characteristic of friable Mor and acidic Moder humus forms. Dryopteris spinulosa var. dilatata auct. non (Hoffm.) Underw.